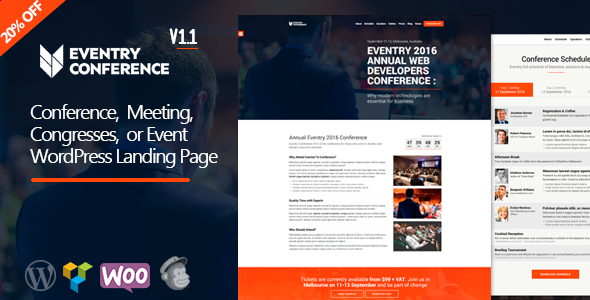 Eventry is a fully functional WordPress theme designed especially for conferences, meetings, exhibitions, etc. It offers multiple integrations with third-party technologies like WooCommerce, MailChimp, and Visual Composer. In addition to these features, Eventry offers a wide range of customizable features which enables the creation of unique and beautiful event landing page. Eventry is a completely responsive website landing page theme which can be easily adapted across multiple devices, display screen sizes, and aspect ratios. It is .POT ready and comes with step by step documentation and demo content to enable the user to create a website efficiently.